My ambition is not to leave behind me a pile of money for my heirs to quarrel about, but to find out what there is of interest in this world before I cross the border and begin to explore the other world. 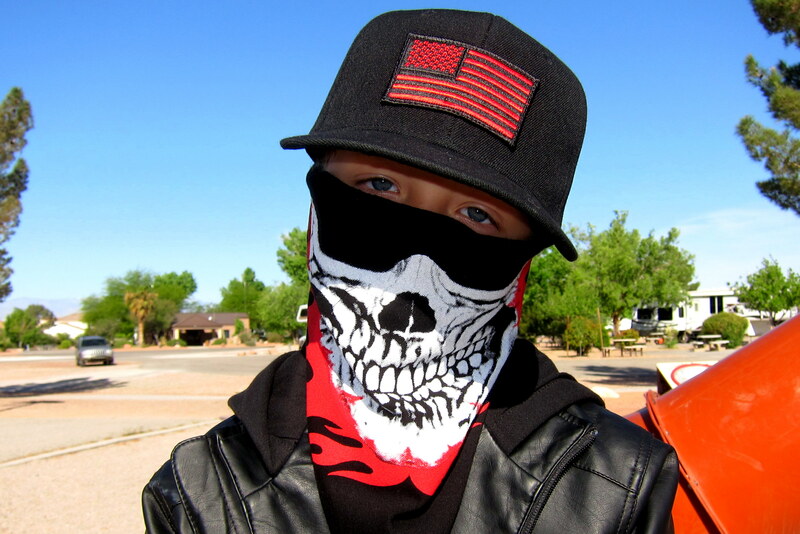 Tuesday, April 7th through Monday, April 27, 2015-Desert Eagle RV Park, Nellis AFB, Las Vegas, Nevada…..Chapter #2: Kit and I are still in Vegas, for a number of reasons. One is that we have things to do and the other is because of these fellows. We primarily extended our stay in order for Kit to complete her six week follow-up with a Retina Specialist, and as mentioned previously, everything looked great (no pun intended). However, as an added bonus we spent more quality time with Jack and Tucker and we took advantage of other enjoyable opportunities as well. 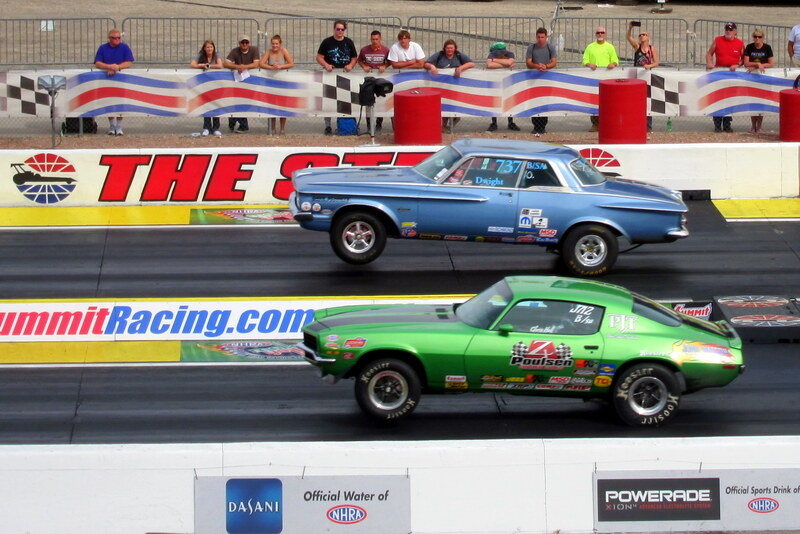 One of my Bucket List items had been to see a major National Hot Rod Association (NHRA) event. So as Kit enjoyed a relaxing day reading and puttering about the camper I took off early one morning to attend the NHRA Summit Nationals at Las Vegas Motor Speedway. 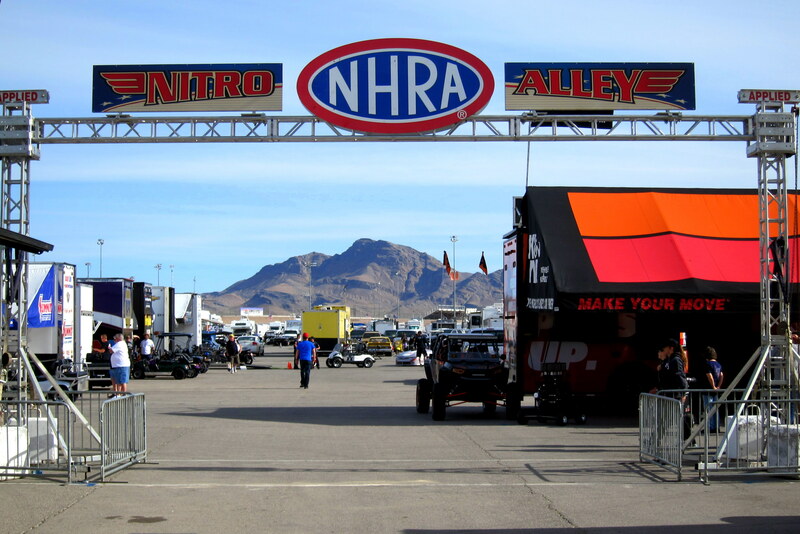 The NHRA was formed over sixty years ago to bring organization to the burgeoning sport of drag racing. Their first sanctioned event was held in 1955 and a few years later I witnessed my first “legal” drag race at the now defunct Sand Diego Raceway. Well, except for the tire smoke! The thrill of watching two purpose built vehicles race side by side for dominance of a quarter mile racetrack is the same. However, the sophistication as well as the overwhelming performance of the drag cars has changed dramatically. 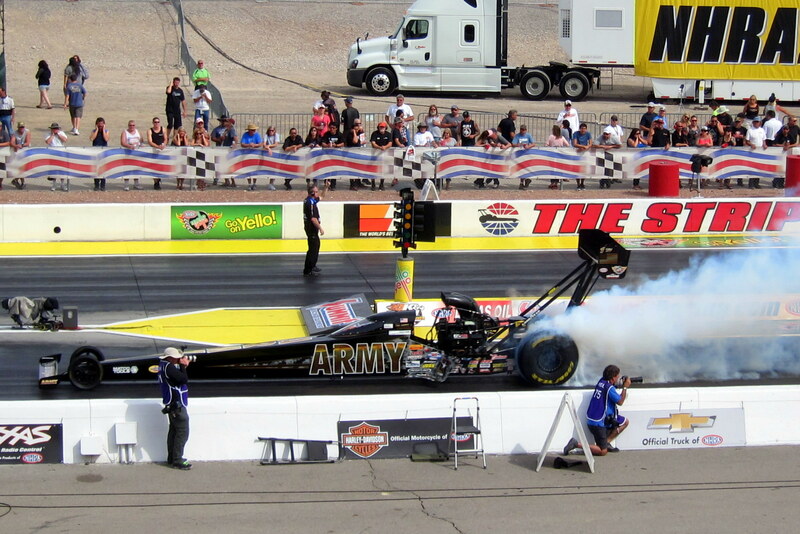 The photo above is of a Top Fuel Dragster piloted by the eight time champion Tony Schumacher. His team is sponsored by the US Army as a “publicity and recruiting vehicle” (pun intended). 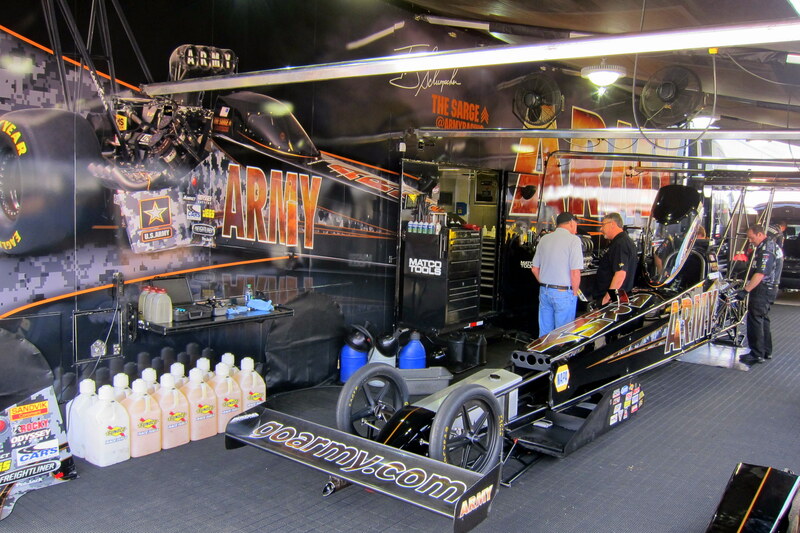 Tony’s 10,000 horsepower nitromethane fueled car can exceed 330 MPH at the end of a 1,000 foot dragstrip…..and all this takes place in just over three seconds! I was surprised however to learn that the racetrack length for the most powerful cars had been shortened recently from the traditional quarter mile to 1,000 feet. This was ordered by NHRA in an attempt to limit the ever increasing speeds following some horrific crashes. One of the things I like about NHRA Drag Racing, in addition to the engineering and performance of the cars, is the accessibility of the drivers by the average race fan. Unlike other sporting events, even drivers who are at the top of their game spend time in the pits working on their cars and talking to folks that stroll by. 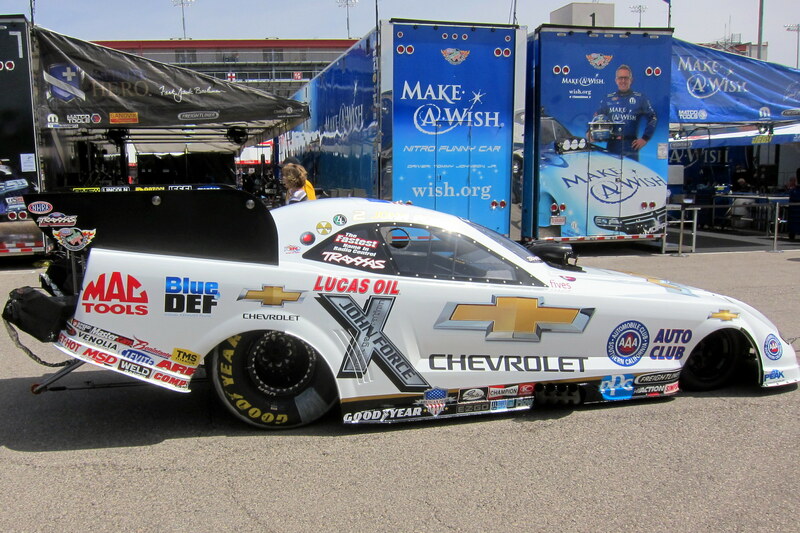 Another legendary superstar in drag racing is John Force. 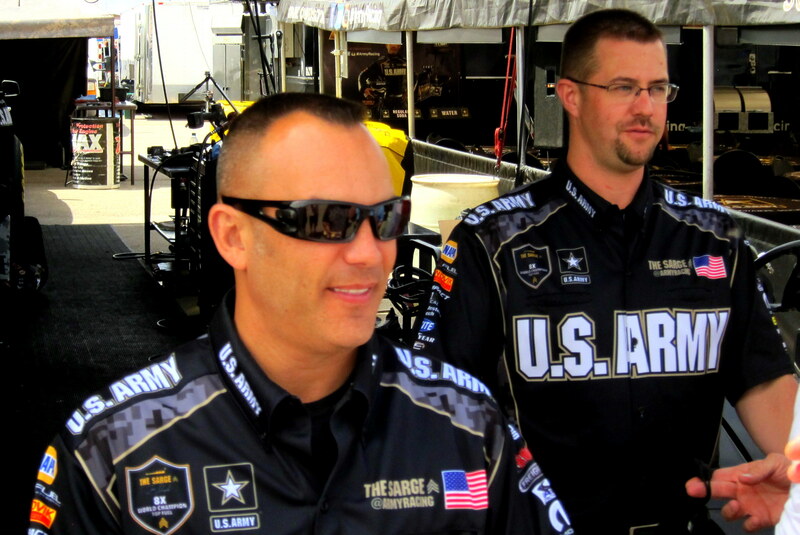 Equally as affable and accessible, John is a sixteen time National Champion in the Funny Car division. These cars feature front mounted engines on a shortened chassis and covered with a full body shell that roughly resembles a production automobile. 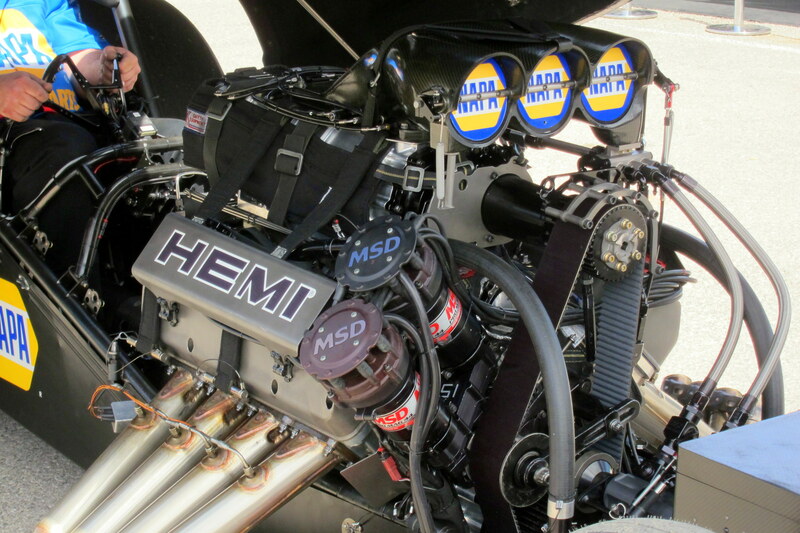 As with the Top Fuel class, the configuration of the engine is tightly controlled by the NHRA but basically is a highly modified version of a typical passenger car engine. 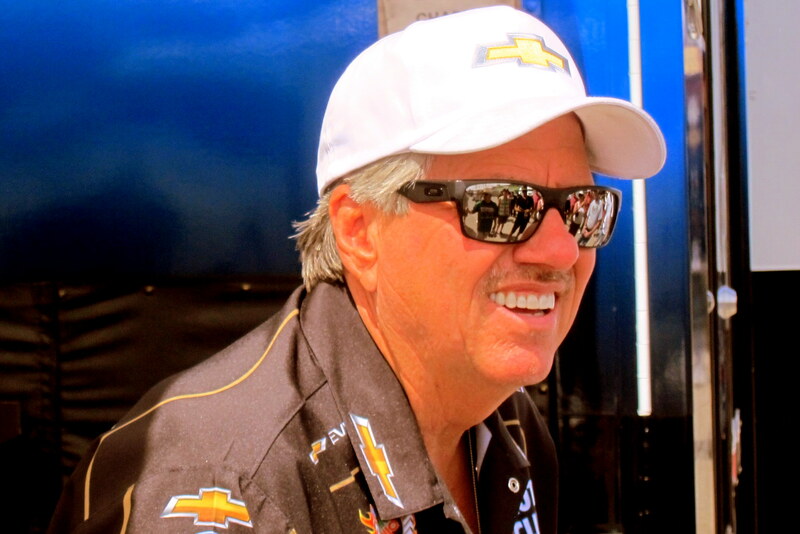 John Force Racing is a family business. His son-in-law Robert Hight races and his three daughters’ are involved in the sport as well…..including 26 year old Courtney Force shown below posing with a young fan. 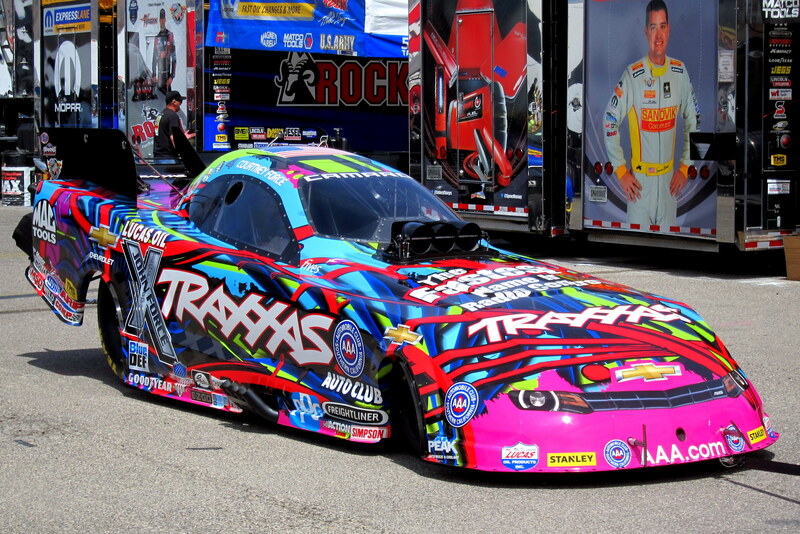 Young Courtney successfully campaigns her own 10,000 horsepower Funny Car! 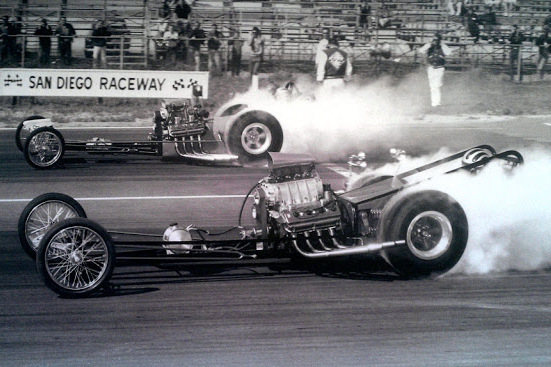 There are more women involved in NHRA racing than most any other form of motorsports and the fan base has changed because of it…..back in the day, women rarely raced and few of them where in the stands. There are many other classes of cars at an NHRA event…..even the average Joe weekend racer can get involved at the Sportsman Level. In addition to unlimited public access to the pit’s, there is an area set aside for venders to sell race souvenirs and a few custom rides to enjoy as well…..like this unusual creation. 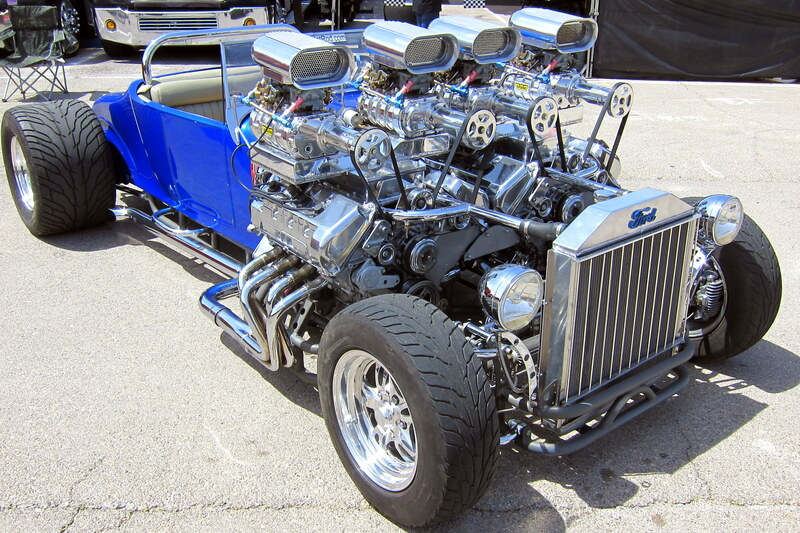 Yep, that’s two engines with four blowers powering that T-bucket hot rod. Being owned by a Las Vegas resident, I’m pretty sure the thing is street legal, however I have no clue how the driver can see over all that machinery up front!?! 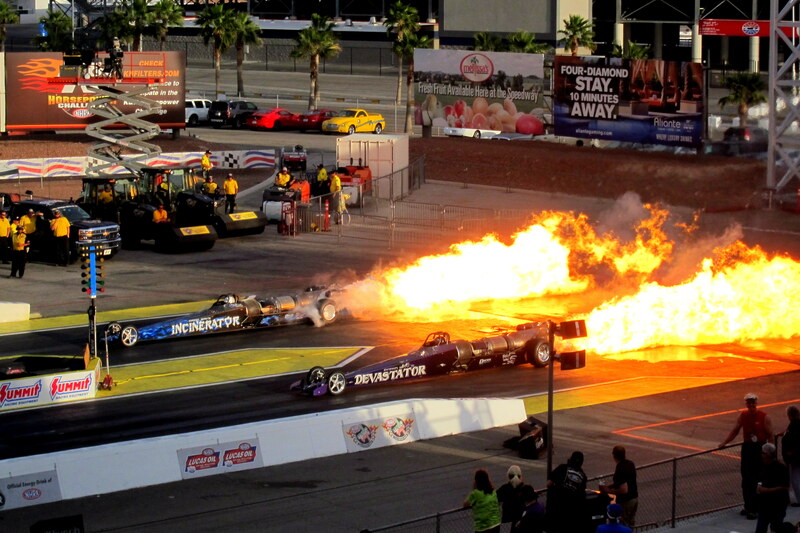 Also at most drag races, there are the novelty acts…..in this case, a showdown between the only two jet engine dragsters on the circuit. 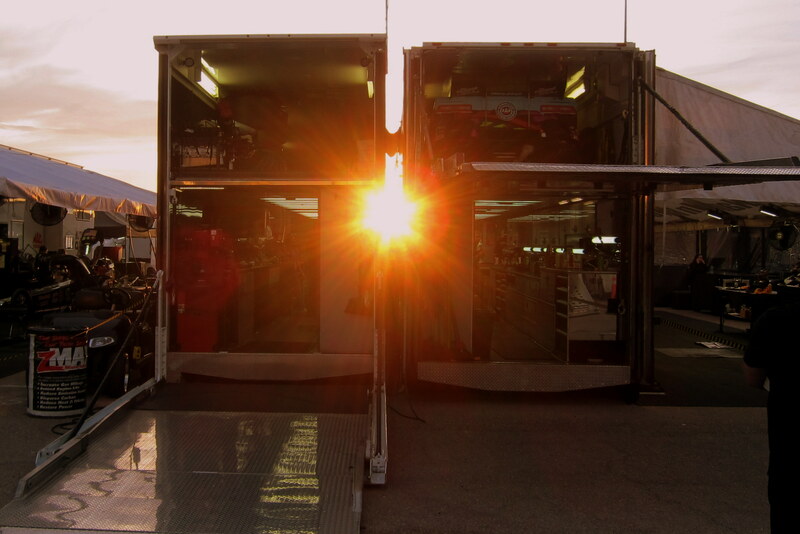 As the cars were put away and the sun set over the pit area, I made my way back to the truck for the short ride to the campground. All in all, a great day at the track! 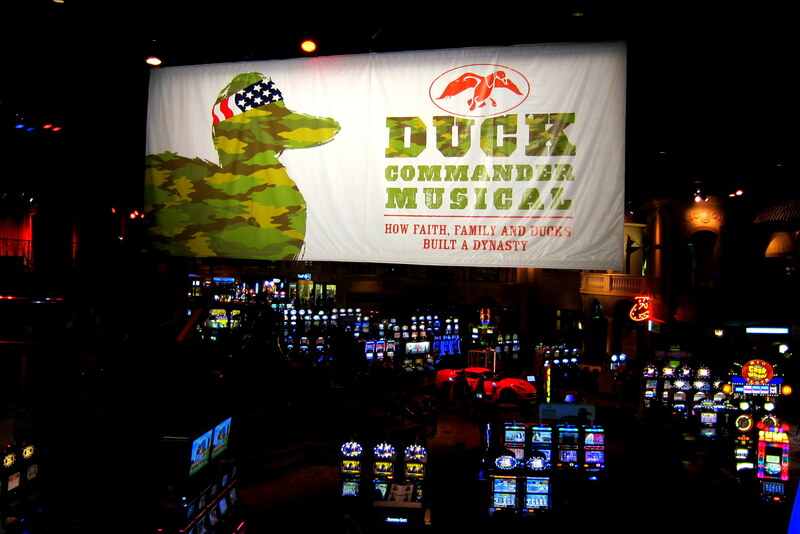 Another unexpected treat thoughtfully provided by an old friend of Suzie’s was a pair of comp tickets to the recently premiered Duck Commander Musical. This live action theater presentation was modeled after the life story of the Robertson family of TV’s Duck Dynasty fame. The music, as well as the performance and story line were very good! The attitude, speech and mannerisms of southern folk were spot on and the actors accurately portrayed this interesting entrepreneurial family. The plan next is to take the show on tour throughout the US and possibly overseas. Keeping with the theme, Kit and I enjoyed great meal at the Rio Casino’s All American Bar and Grill. 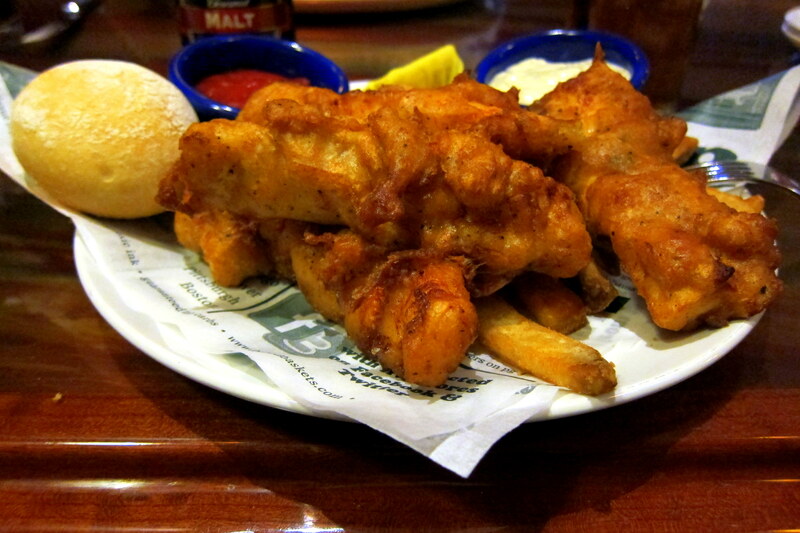 The catfish dinner I ordered was the best I have experienced since leaving Mississippi! A trip to Las Vegas would not be complete without a few photos of the bizarre sights we came across during this year’s stay. 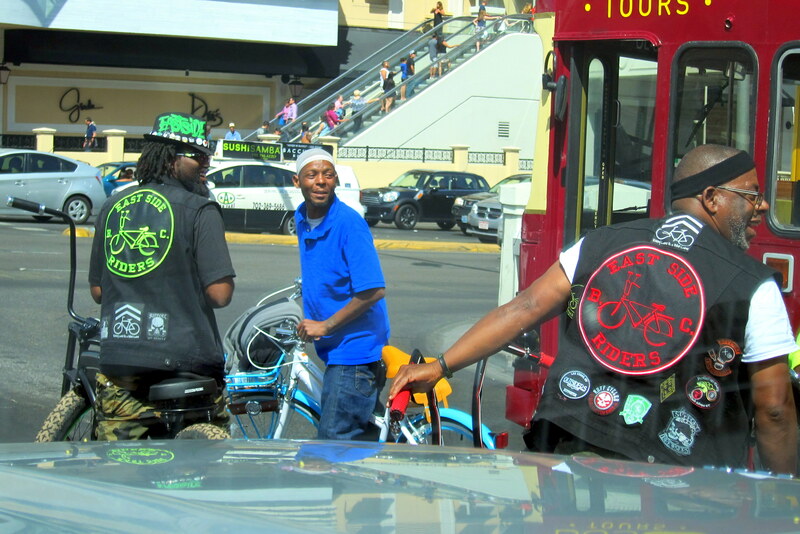 First was the East Side Riders Bicycle Club….we caught them cruising down the strip to loud music with a heavy bass beat emanating from an old time boom-box. Then we stumbled upon the Wienermobile in front of the Nellis AFB Commissary. 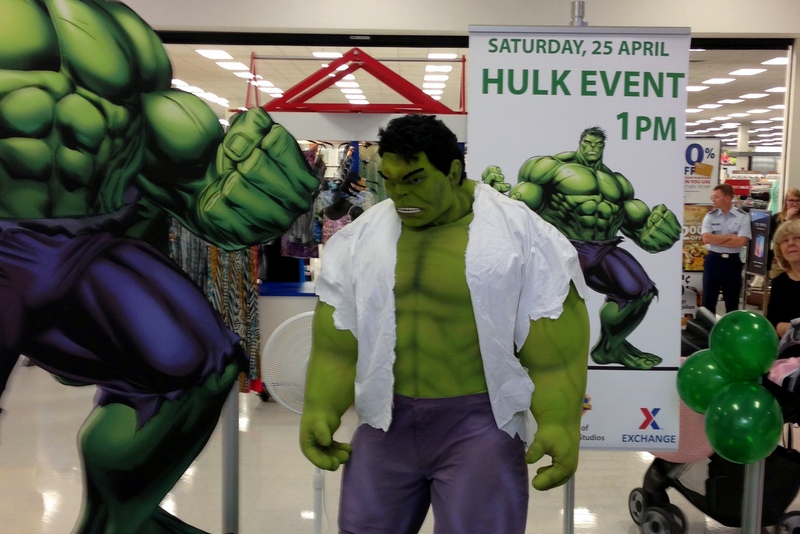 And bumped into the Incredible Hulk at a local shopping center! 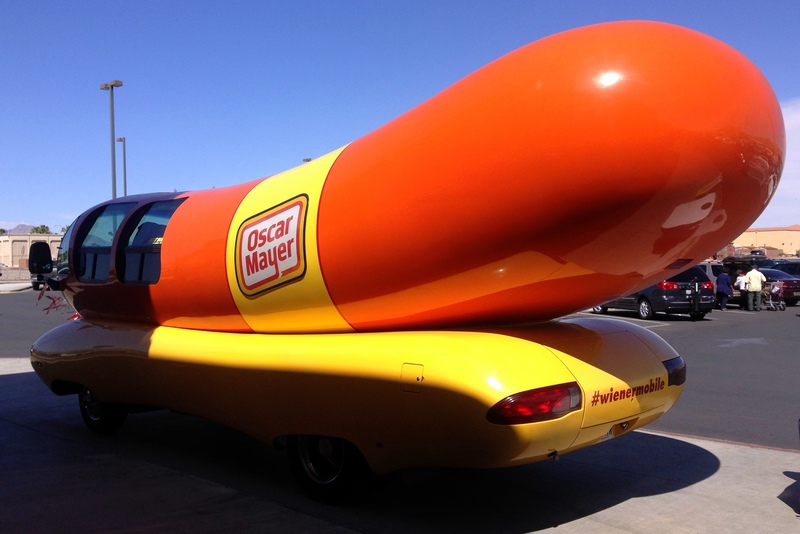 You know…..there’s an obvious joke about The Incredible Hulk and the Wienermobile, but it was vetoed by the editor in chief. She claims I have the sense of humor of a 12 year old…..that’s insulting, my humor level is clearly in a lower age bracket! And, last but not least, this character! 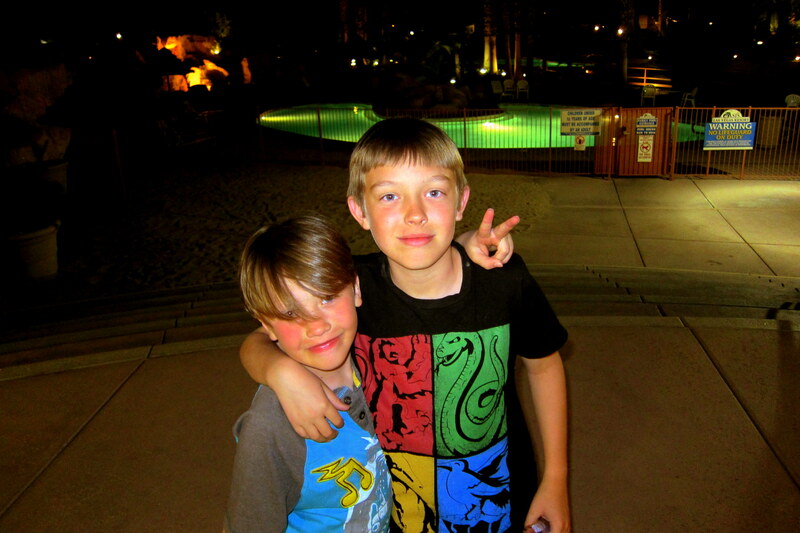 We’re gonna miss those little guys…..Oh, and their parents as well! 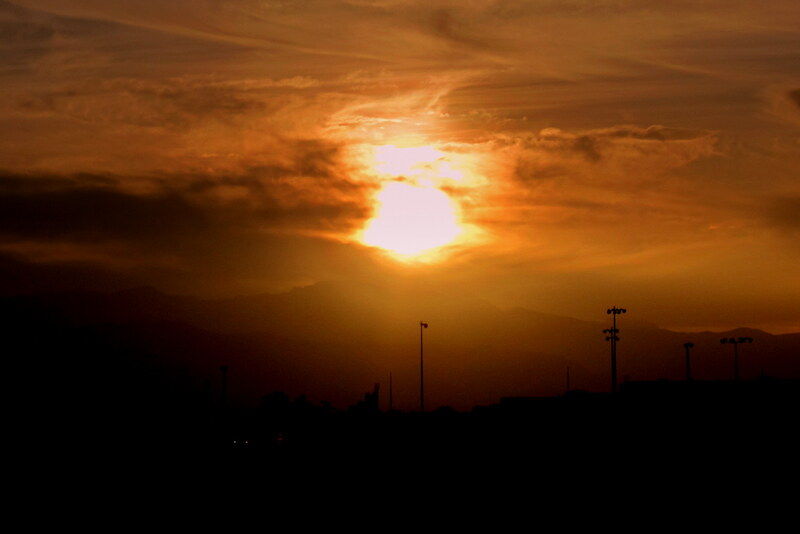 As the sun set on our final day in town, Kit and I agreed that we are truly blessed to be able to visit and enjoy our Las Vegas family as much as we do. Tomorrow we hit the road toward California. 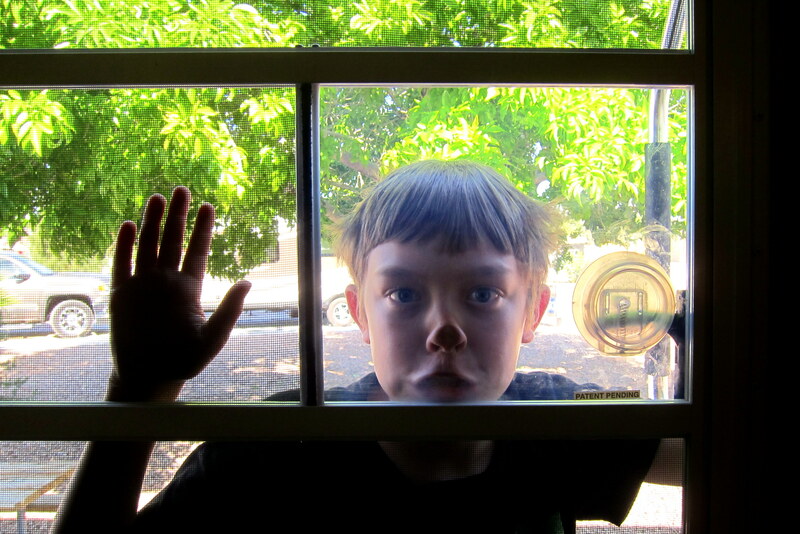 You may be asking yourself, “when are those crazy kids gonna start heading home”! Well, wish we had an answer for you, but we don’t know ourselves. Life on the road can be intoxicating and it is hard to bring the adventure to a close. Tuesday, April 28, 2015: Up, broke camp and hit the road by 1000. This had been one of the longest stays at any one place in the seven years we have been winter RV’ing. 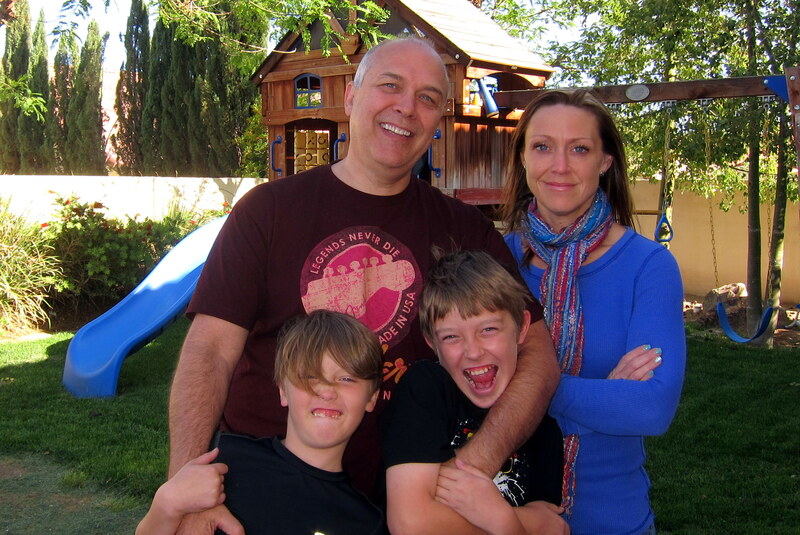 Kit and I had a fantastic visit…..we thoroughly enjoyed time with family and friends, were able to accomplish a number of modifications to personalize the new camper (to be chronicled later in a separate issue), and enjoyed more of the sights and sounds of Las Vegas. However, it feels great to be rolling down the highway once again! 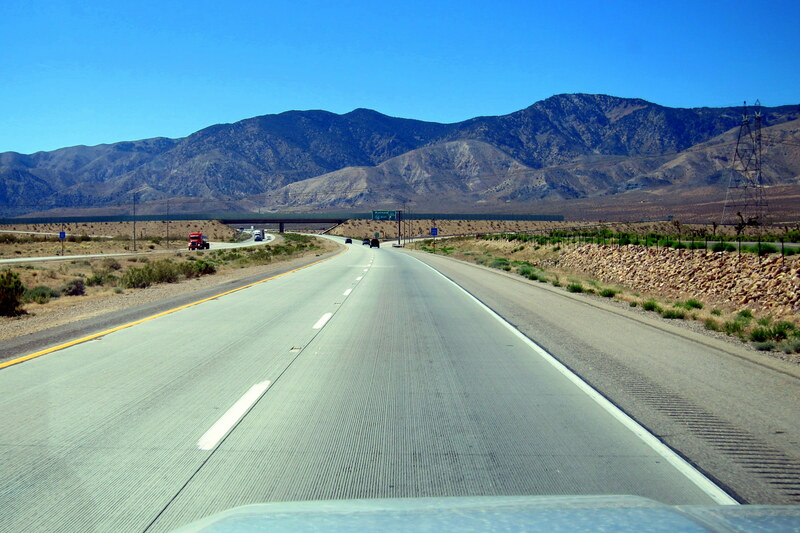 Jumped on I-15 heading south and soon the Vegas skyline disappeared in our rear view mirror as we rolled through the Mojave Desert. 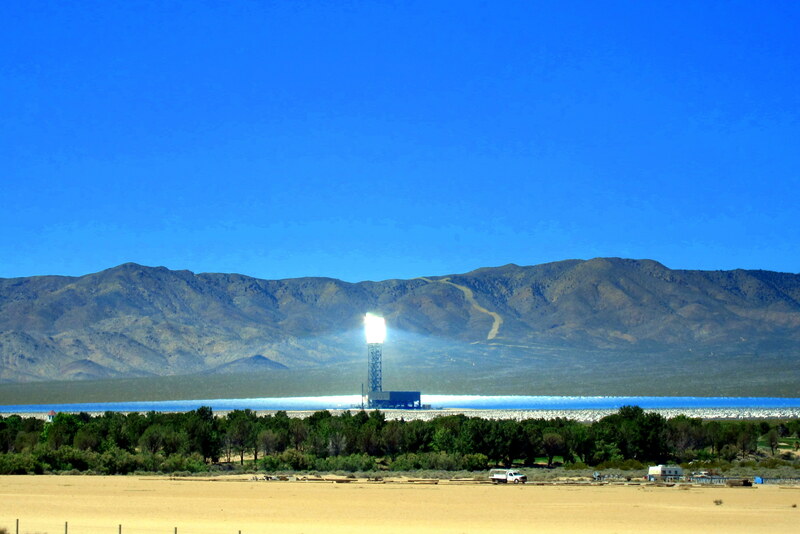 An hour later we crossed the California border and passed the strikingly unusual Ivanpah Solar Power Generating Station. 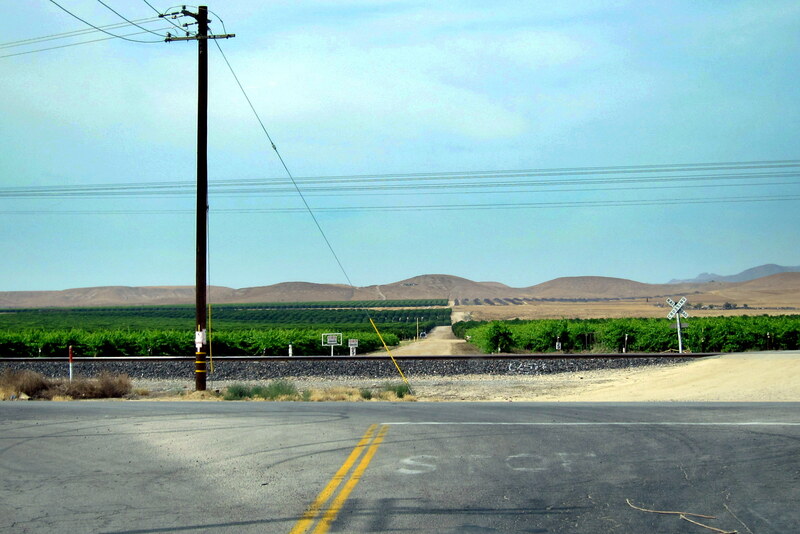 Nearing the town of Barstow, we decided to take a shortcut to the north of the town on Old California Highway 58. Nice drive along the outskirts of Barstow with many old dilapidated buildings housing fringe business such as junkyards. At one of the latter I was surprised by the following sight that I immediately recognized. It’s a QA-50 Drone Anti-Submarine Helicopter (DASH) used by smaller US Navy warships as a torpedo and depth charge delivery vehicle. In the mid 1960’s I was a crew member on an old beat up World War II era tin can (destroyer) and we had two of these contraptions on board. The 13 foot co-axial helicopter had a 70 mile flight range and cruised at 50 knots……it also fell out of the sky on a regular basis. The drone was launched from a small flight deck by a controller standing at a nearby console. Once clear of the ship, control was transferred to another pilot sitting in front of a radar screen in and interior space called the Combat Information Center (CIC). Generally, that was where the mishaps would occur. It wasn’t unusual for the CIC controller to lose situational awareness and “pilot” the DASH bird right into the ocean, but more often the primitive radio controls would malfunction and the drone would just hum along over the horizon and eventually disappear from radar. On my first ship, the USS Hamner (DD-718), we had one of our DASH birds configured for optical surveillance by adding a TV camera. In this configuration it was known as a “Snoopy Bird” and featured a figure of the cartoon character Snoopy on each side of the fuel tank. We crashed that one as well a few miles north of the DMZ in Vietnam…..the onboard recorded video was pretty entertaining. 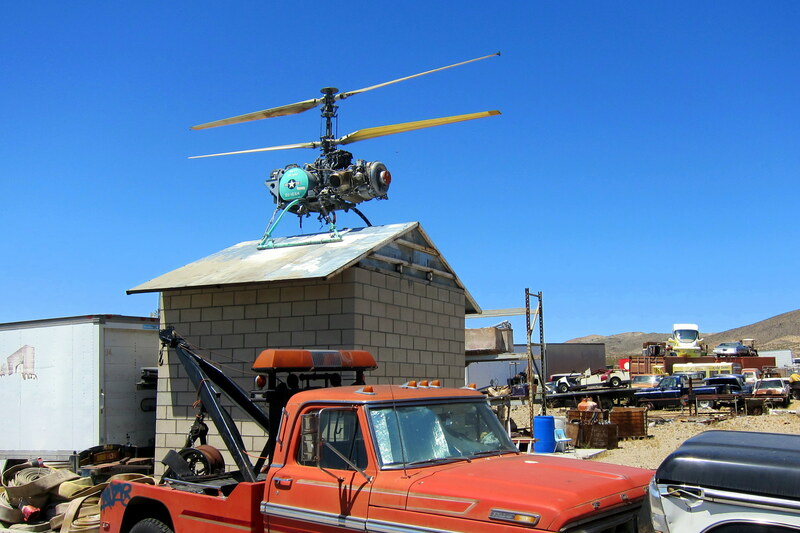 I found it amusingly ironic that the DASH we spotted in a Barstow, California junkyard was sitting on top of a small building that resembled a doghouse…..long live Snoopy! After the trip down memory lane, we pulled out of the junkyard parking lot and continued on. 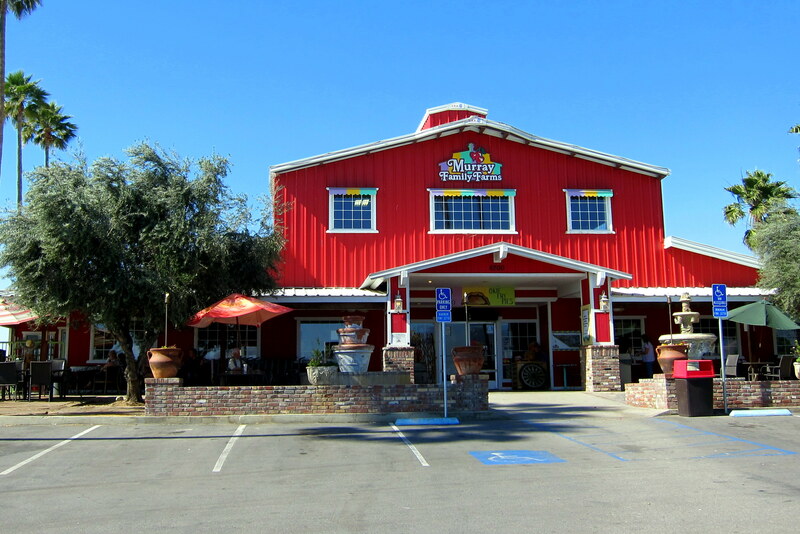 From Barstow, we headed north on CA-58 through Tehachapi before coming to Murray Farms on the outskirts of Bakersfield, California. Since it was a good place to stop for a break, and the parking lot accommodated RV’s, we did! 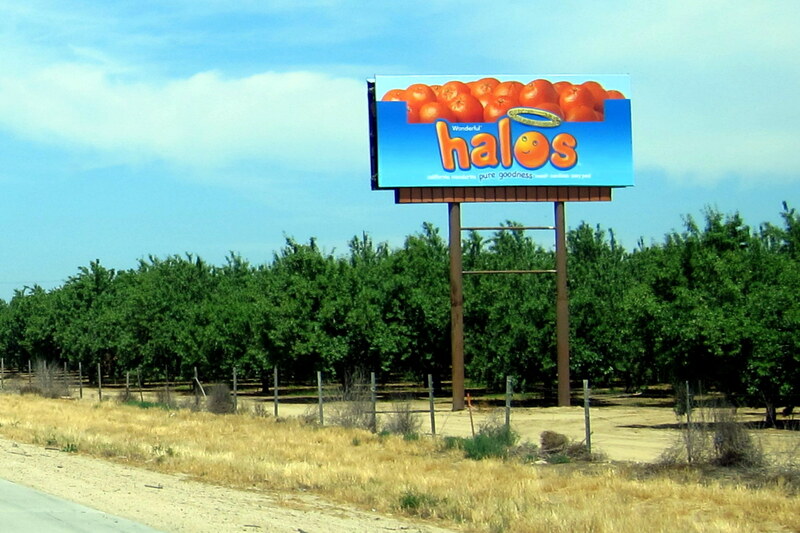 After selecting some healthy fresh fruit and some not so healthy snacks, Kit and I hit the trail once again for the short drive into Bakersfield. 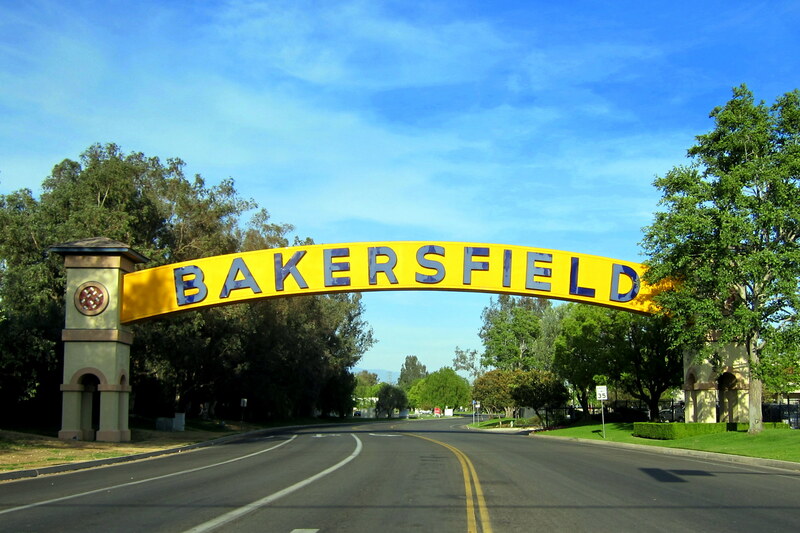 We came through this area last year on our search for the holy grail of RV’s and Kit noticed that Bakersfield was the adopted hometown of the country music star Buck Owens…..so a return trip went on her bucket list! 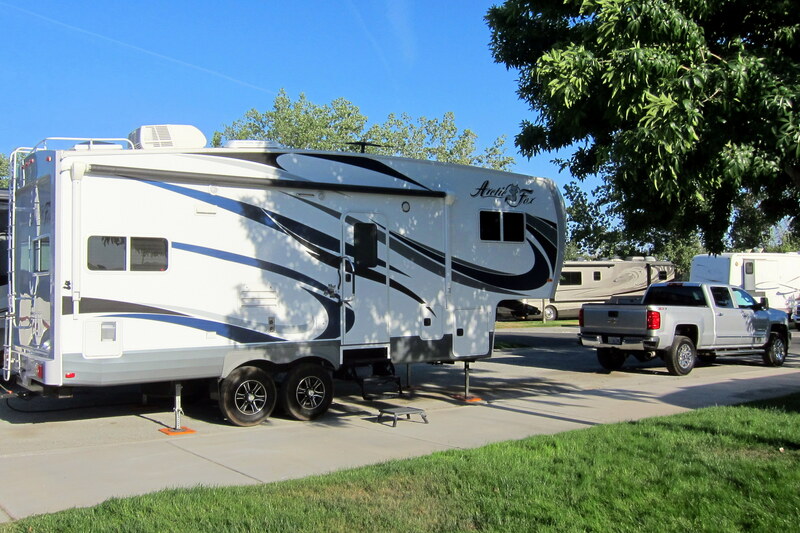 We choose the River Run RV Park and registered for two nights in a nice site along the dried up Kern River. Two nights stay will give us a full day to relax and explore the area. 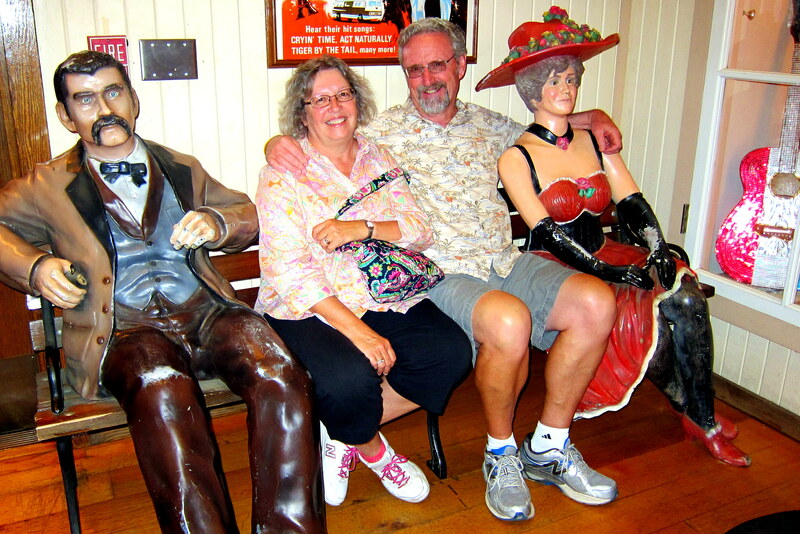 Wednesday, April 29, 2015-Bakersfield, California: After securing reservations for dinner at Buck Owens restaurant and dance hall known as the Crystal Palace, we set out to investigate the area. 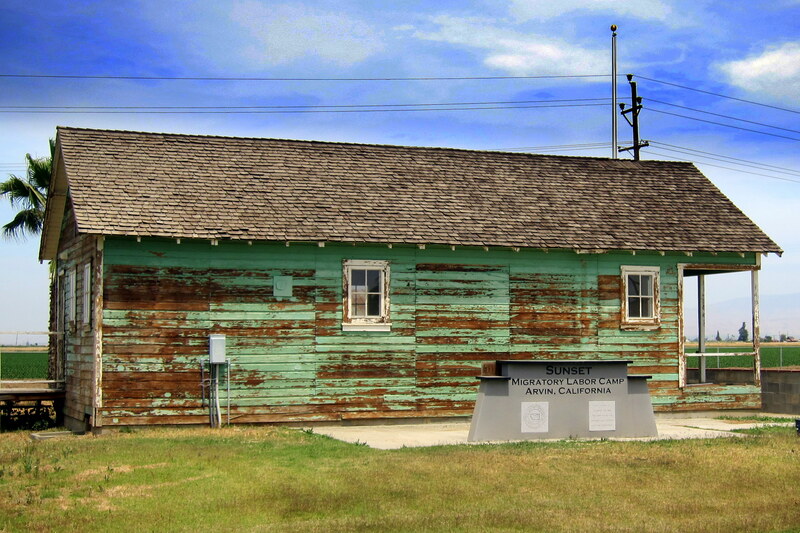 A variety of back roads took us to the small town of Weedpatch and an interesting museum chronicling the life and times of Oklahoma dust bowl refugees. Unfortunately, the museum was only open on the weekends. However fortunately, as I was snapping photos over the fence, a big old farm truck made a U-turn in the middle of the road and pulled up behind our truck. Then a little old lady hopped out and asked if we wanted to see the museum! Turns out, Faye is the daughter of a dust bowl family and was raised here picking crops along with her entire family. She now owns a large ranch in the foothills and is one of the docents at the Weedpatch Poor Farm museum. Kit and I spent about an hour visiting with Faye And hearing her stories of growing up dirt poor. Before leaving we gave the association a donation and thanked her very much for taking time out of her day to spend with us…..what a great lady! Making our way on backroads toward the campground we drove through miles and miles of productive farmland. And, vast acres growing my absolutely most favorite fruit! If you haven’t enjoyed California Mandarins, you do not know what you’re missing! 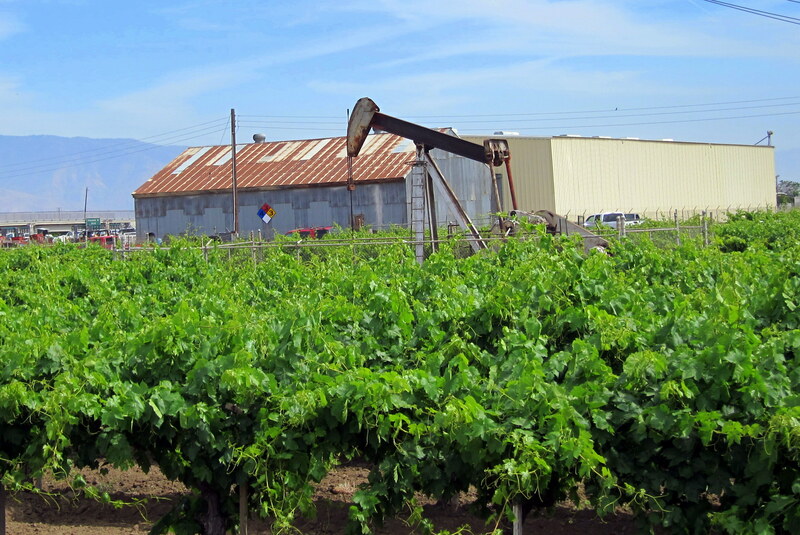 There were even farms that sprouted oil wells! Or, actually…..I bet they were pumping orange juice!? Back in the camper, we cleaned up a bit and headed for The Crystal Palace. Buck Owens built the Crystal Palace as a music and dance hall in 1996 in order to give the young country music performer a nice place to play, unlike his early days of playing in old rough honky-tonks. 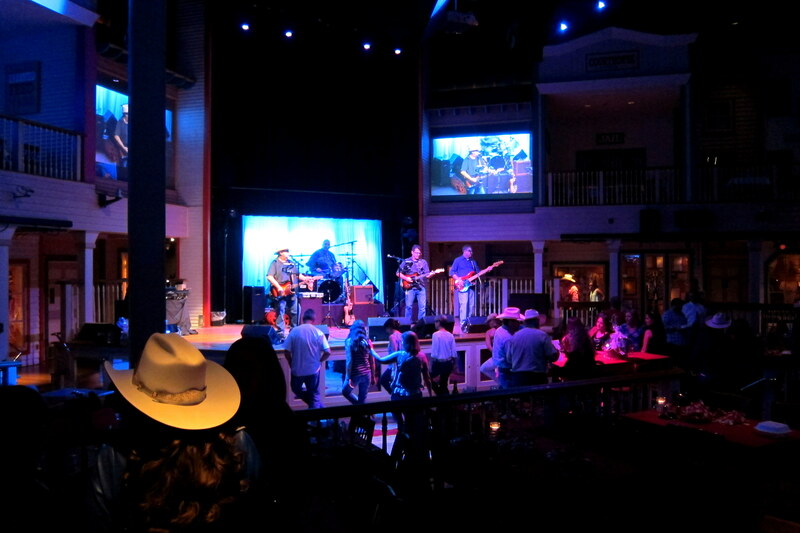 The Palace, as it’s called locally, also features a saloon/restaurant and around the perimeter of the hall, a museum of Buck Owens memorabilia. 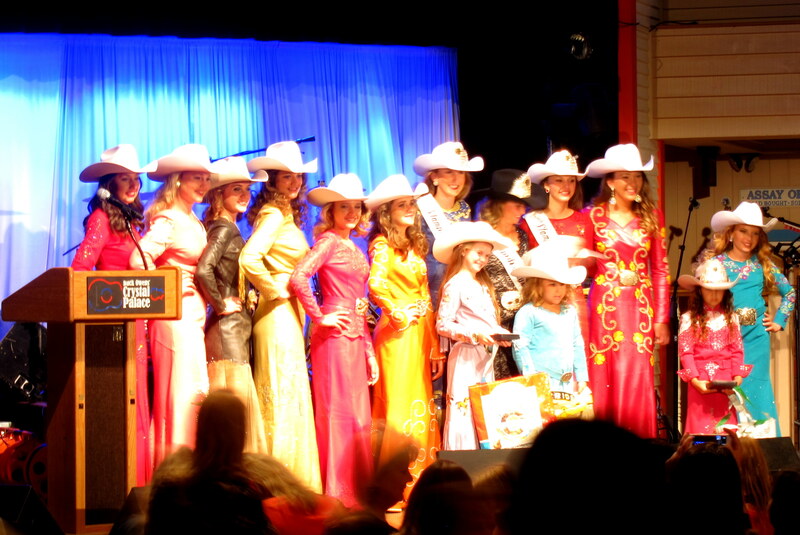 Walking in, Kit and I were surprised and pleased to witness the annual pageant to select the queen for the local Stampede Days Rodeo. We enjoyed watching the finalist in each age category do their thing. An order of appetizers and an adult beverage was enjoyed while observing the young ladies answer the judge’s questions and speak of their goals for the future. It struck me that the California I grew up in and knew was worlds away from the California in the center of the state…..and that’s a good thing! 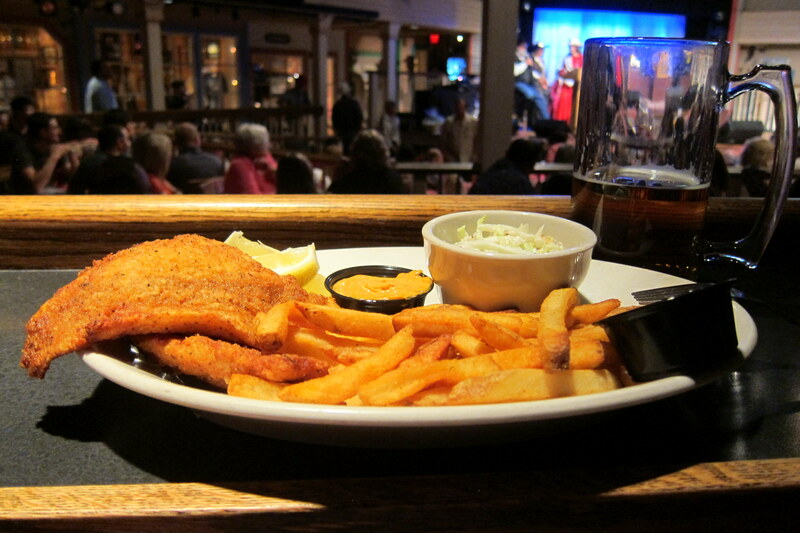 As the pageant was coming to a close and the country band was tuning up, our meal arrived. Fried Catfish for me and baked salmon for Kit. Mine was pretty good, but Kit reported that her salmon was the best she had ever tasted. So if ever dining at the Crystal Palace…..order the salmon! As we ate the band played, and the dancers did their two-step thing. Kit and I decided if it weren’t for the California license plates on all the pickup trucks in the parking lot, we would swear we were in Texas! Also, I think we blended in pretty well…..don’t you? A great stay in Bakersfield, but tomorrow we head north to explore more of our former home state. Thursday, April 30, 2015: Left late in the morning because this portends to be a short travel day. 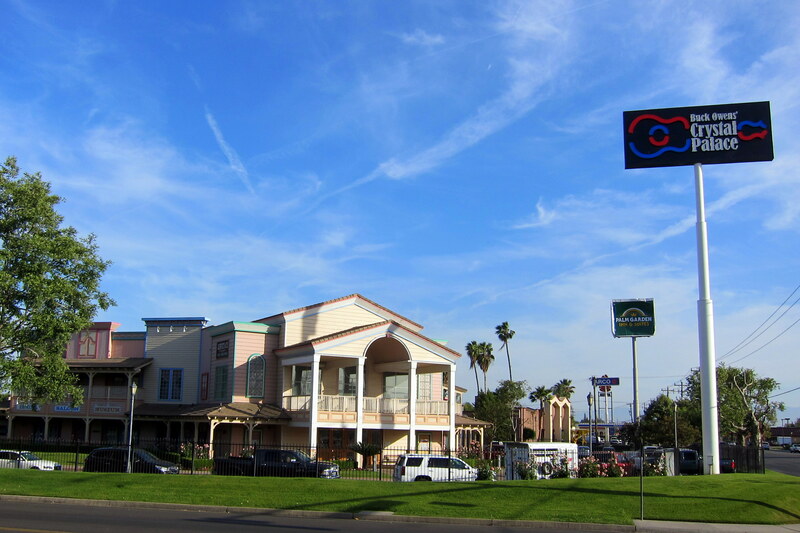 We jumped on CA-99N and traveled the ninety miles to our next destination, Lemoore, California. This will be our staging area for exploring Sequoia and Kings Canyon National Park’s…..stay tuned! Kit’s Bit’s: What a delightful time seeing more of California! Considering we have called this our “home state” for many years, we really only knew a small area of it. Many people think California is all about fires and earthquakes. Not so! There are so many lush farm fields, beautiful mountains and streams, never mind the ocean. And, so many interesting little towns along the way and lots of people eager to share with us their experiences and lives in good old California! Such a beautiful and diverse state! Who knew! I have absolutely loved this tour of our “home state”! Enjoy Sequoia and Kings Canyon! Truly one of my most favorite places! Worked up there for a couple of years in my early 40’s…. OK, Bill and Kit, you’ve had great adventures and it’s now time to come home. The winter from hell is over in Maine and flowers need planting. We miss you. Hi neighbors! We miss you as well and are on our way east. Hope to be home by the end of June. Take care and enjoy the flowers that Kim planted. Hey bud, great to hear from you! We are sloooowly meandering our way home. Hope to see you at some point this summer. Take care, tell all that may remember me that all is well and I said howdy! Don’t know what to say! We thoroughly enjoy your adventures. How great to get to know more of your”home state” after all these years! Anxious to learn more as you wander north. Hi folks! We keep saying we are going to stop at Sequoia and Kings Canyon parks….so now I guess we need to start a Bucket List, too. Sure enjoyed visiting you folks here at our home in Bend….keep up the good work, Bill. I am totally fascinated by your use of the English Language! John R. is finishing up the wiring project…and I am trudging to and fro, getting clothing and food into the new rig….and it is RAINING here in “Sunny” Bend, Oregon! Travel safe! Thanks, you too! And what a grand time Kit and I had visiting your home! Also, thank you for the very nice compliment concerning my website offering. It started out small, as a way to keep the family appraised of where we were and what we were up to…..who knew it would grow as it has!?!? Bill, I’ll stick with Pontchartrain po-boys catfish or seafood platter. ALWAYS AN INTERESTING JOURNAL, SO MANY INTERESTING PLACES AND PEOPLE. BAD NEWS, JEANNE TOOK A HEADER AND DISLOCATED AND BROKE HER LEFT SHOULDER. THIS WILL PUT A KINK IN OUR ROPE FOR A COUPLE OF MONTHS, THAT’S FOR SURE. THE HOUSE PAINTING IN AND OUT ARE COMPLETE AND DO LOOK SPIFFY. DOCKS AND DECK ARE COMPLETE AND LUND GOES IN NEXT WEEK. ENJOY YOUR RETURN TRIP AND BE SAFE.